Those of us who knew Phyllis Jacobson and her husband Julie will realize that her death brings to a close a long and rich chapter in the history of the revolutionary and democratic socialist left in the US. She was the last of a small but heroic generation. Starting with the YPSL Fourth International, the youth section of the Socialist Party that split under Trotskyist leadership to set up the Socialist Workers Party in 1938 she and Julie ended up in the Workers Party (later the Independent Socialist League) when it was formed in 1940. She and most WPers, followers of a then still revolutionary socialist Max Shachtman, spent the years of the Second World War working "in industry," trying to radicalize the fast growing Labor movement. After the war Julie and she founded the anti-war Third Camp socialist journal ANVIL, which was directed at students and which had a circulation in many thousands . I remember we sold more than 1,000 at City College alone in 1951, and it was a big item on the slowly growing student left in Berkeley, Chicago, Brooklyn and other centers of student activism against the Korean war. It was at ANVIL editorial board meetings in their Greenwich Village apartment that we first met. The Jacobsons remained active when the ISL and ANVIL ended up in the Socialist Party in 1957. In the Party she (and I) remained "hard left" third camp anti-war socialists. 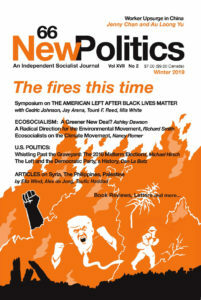 When the Party split in 1970 and DSOC (later DSA) were founded we lost regular personal touch, but we remained in contact through New Politics, which was and remained the premier Third Camp, anti-Stalinist independent socialist journal in the US, perhaps the English-speaking world. In her last years she was very ill. Her life companion Julie died leaving her to cope with almost complete paralysis. Her son, Michael and daughter-in-law Lynn remained political and active in DSA. She will be missed as a brave link to a revolutionary democratic socialist past which must not be forgotten.